It was in the forties when Cherry and I met and rode tandem to park my car on North Madison Road and then park at the Route 80 lot. The sun was strong, the air crisp, and a tint of color marked the maples. By nine o’clock, we were on the trail, with 2.2 miles ahead. 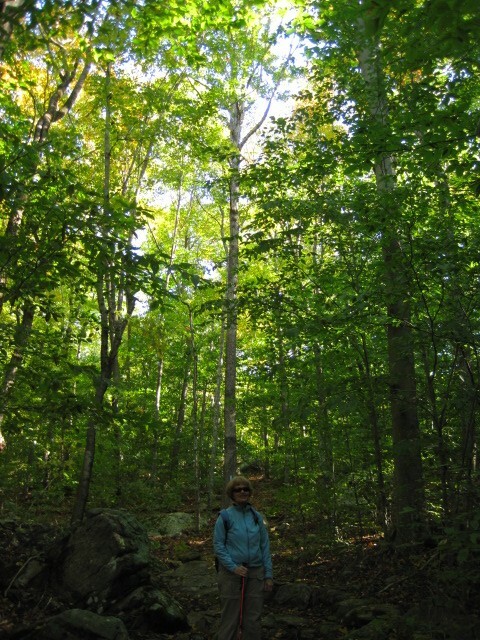 With its clear markings, we had no difficulty hiking this section known as the Timberlands. We continued a conversation that had begun in the car about relationships and whether to pursue them. “I tend to fall in love with people, all kinds of people, men and women,” Cherry explained. “I just love them. And I am attracted to what certain men do.” I told her I understood what she meant. She went on to clarify that it didn’t mean they would be appropriate partners. In fact, she wasn’t certain she wanted a partner. She was feeling so connected to her home community and didn’t want to lose that. 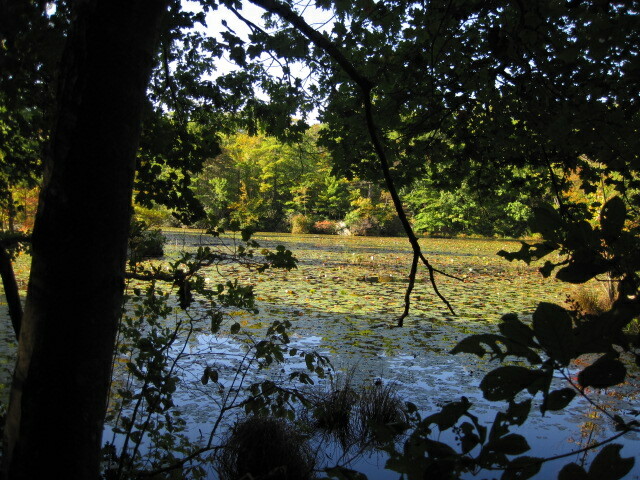 About an hour after starting, we found ourselves along the shore of Upper Guilford Lakes. The multiple shades of green and juxtaposition of water, sky, and vegetation was breath taking. We decided to sit on the bank and enjoy the view for a few minutes. I shared some of my recent experiences including time with some mutual friends at the Durham Fair, music at Pipes in the Valley in Hartford, the Last Green Festival in Brooklyn, and cold leads and hot starts with relationships. A short distance away, we came to the Lake’s feeder stream, merrily gurgling along, cascading over rocks under a canopy of green. We were mesmerized by the sounds and scene. Cherry gushed over the view (anyone who knows Cherry understands what I mean) and again we paused to enjoy before continuing along. 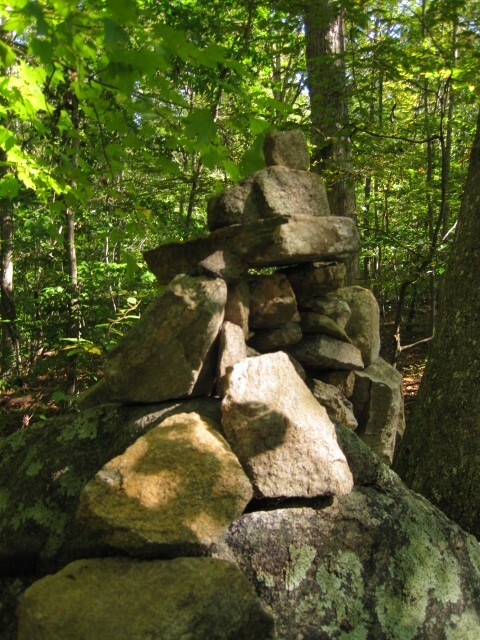 Along the way, we noticed attractive cairns marking trail junctions, some of which resembled small fairy houses. We were nearing the end when I spotted a garter snake sunning on the trail. Cherry, afraid, hung back, while I shooed it safely into the brush and stood between it and the trail, so Cherry could pass. The last section passed through forested wetlands with short boardwalk sections that again engaged the senses. “This is the loveliest hike we’ve done so far,” Cherry said. And I had to agree with her. Sounds wonderful – wish I could have joined. So glad you and Cherry enjoy each others’ company and appreciate a beautiful day in a beautiful place. It seems that it was likely a tad brief, though,..? Yes, we had to finish up this piece we missed last time, due to a car key snafu. more next time, but we are nearing the end of the line for this Blue Trail. 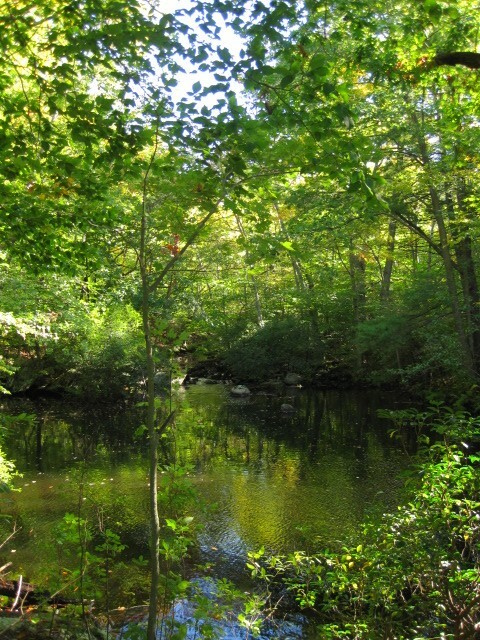 A pleasure to read, Beth; thanks for taking us along, to see and hear the stream “merrily gurgling along, cascading over rocks under a canopy of green,” to be surprised by a snake on the trail, to gain insights about relationships. The pictures, opened up to full size, confirm the beauty you found. Looks like it was the perfect hiking day. Envious! Nice pics, it shows how much fun this hiking places involves. Hiking is a wonderful experience and everyone must enjoy this at least once in a year. It increase your immunity, will power ability to face challenges.